Have you ever needed to search through GBs of W3C log files for a specific string such as an application, user or site? If you’re comfortable with the command line, you may have turned to grep or findstr, or perhaps you purchased a commercial application to search your logs such as PowerGrep. The downside of grep/findstr/grepToolXYZ is they generate a new file that does not necessarily adhere to the format or structure of the original log file. The output is often stripped of all W3C log headers, and many tools even replace delimiting characters such as tabs with spaces. 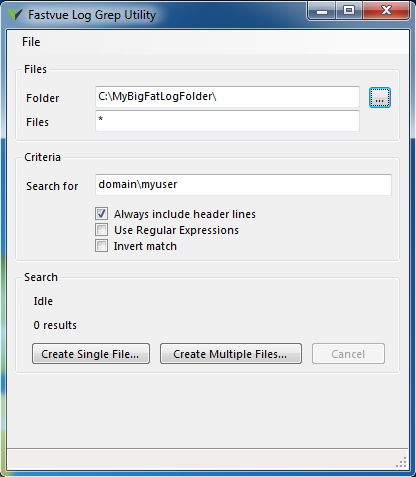 The end result is that you have a file containing your search result, but the file is incompatible with your log analysis application (such as WebSpy Vantage). To solve this problem, we developed a simple Grep tool for Windows. It takes a folder of W3C text logs (or any text files), and produces new files containing only the log lines matching your search criteria. The new files are unaltered in format and structure and retain the original log headers. The Fastvue Log Grep Utility is perfect for cutting down a folder of Forefront TMG or ISA Server W3C text logs to just the information in your search string. You can then import these reduced files into WebSpy Vantage, or any other log analysis app. The Fastvue Log Grep Utility supports plain text search, regular expressions, inverted match (find everything except), and can merge results from multiple files into a single output file, or create multiple output files. Fastvue Grep Tool for W3C Logs. Retains log headers and structure of the log file. Although it was designed for keeping the structure of W3C text logs, it can also be used to search any type of text file. Just ignore the option to ‘Always include header lines’. Hopefully it makes your life a little bit easier. Either way, we’d love to hear your comments below. Scott, Thanks so much for providing this handy little tool. It is efficient and works beautifully. I was struggling with grep after being inspired to try it and your tool saved the day…and made me look really smart. Bonus! I plan to feature your tool in an upcoming tutorial on grep for SEO. Great work and thanks again!